Toyohara Kunichika (1835-1900) Actors on Battledores: Ichikawa Danjuro as Jaraiya, 1880’s. Koban. This small print is from a rare series of koban prints done in the 1880’s of well known kabuki actors pictured as if painted on the backs of battledore bats. Battledore is similar to badminton and originated in Japan in the 1600’s as the game Hanetsuki. Kunichika started his career as an artist being employed to paint the reverse sides of the bats which by the Edo period had developed religious, superstitious and cultural value (battledore bats were by then traditional good luck gifts for new born girls). This koban sized series willl have had particular significance then for Kunichika. This type of print is the nearest that true ukiyo-e gets to the western idea of the still life. Here Kunichika pictures the bat and a decorative ball in three dimensions; the actor portrait being in two dimensions when viewed in the shallow space of the picture. 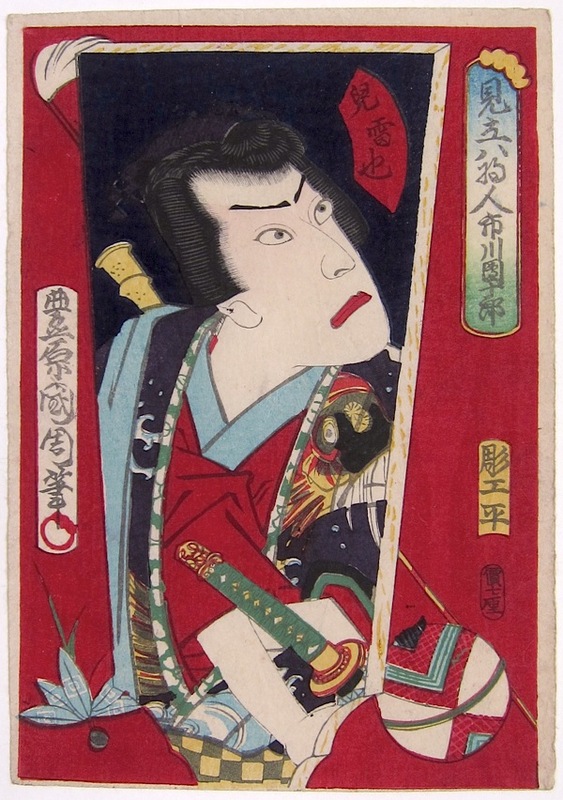 This print shows a portrait of the kabuki actor Ichikawa Danjuro playing the folk hero and magician Jaraiya. Jaraiya’s story is told in the kabuki play Jaraiya Goketsu Monogatari. Jaraiya is orphaned by a warlord possessed of the spirit of an evil snake; he is brought up by a hermit and learns magic skills (in his case that of a toad). The saga relates how Jaraiya goes on a quest to avenge the death of his parents by finding a magic sword. He, his companion (skilled in the art of toad magic) and his sister succeed in defeating the magic snake and thus also saving the world from its evil. The print is full size and in fine condition. The colour and impression all fine.